I have truly enjoyed Lian Hearn's Tales of the Otori and was happy to see a new novel in the series on my library's shelves. Unfortunately, this conclusion to the saga was unsatisfactory. In a nutshell, it started too slowly and ended too quickly. The first part is bogged down with expository passages that appear to be meant to bring readers up to speed on what has gone before and who's who. A function better performed by a "Prologue," a "What Has Gone Before," or a dramatis personae w/brief explanatory notes. And while Takeo remains a likable and interesting character, there's no real focus on any character. We hop from Takeo to Kaede to Taku to Hisao (Takeo's illegitimate son through Yuki) to Takeo's and Kaede's daughters w/out really becoming involved with any of them. The result is that we don't really care about any of them (w/ the exception of Takeo and Kaede whom we've had 3 previous books to get to know). 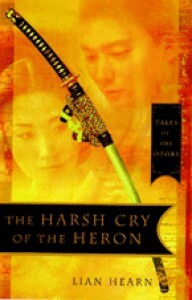 There are also new plotlines brought up that are then left hanging - i.e., Takeo's sister Maderen suddenly shows up as an interpreter for the mysterious foreigners from the West (thinly disguised Portuguese explorers); and Hisao is a "ghostwalker" - a shaman who can speak with the dead - but his attempt to deal with it is left unexplored. These are just two examples. Another plot development that disturbed/distressed me was the realization that Kaede is not very nice or wise - she plunges the Three Countries into civil war when she finds out about Hisao and she's a cold and distant mother to the twins Maya and Miki. Overall, while I continue to be interested in the Tales of the Otori, I hope that future volumes focus more on a few core characters and exercise a better control over the narrative arc. To readers of this review: I would recommend starting w/ the first Tale, The Nightingale Floor, which was really good. The next two tales generally managed to keep up the quality of the first, though upon reflection I realize that they were beginning to show the problems I had with this installment. Hearn is still an author worth a look, and I hope the next volume (which promises to be a prequel to Nightingale) can return to the quality of that work.